I’ve finally made progress on this project, a cigar presentation tray commissioned to me by the same client I completed the Mechanical Cellarette for. During that building process I had two other commissions that I had put on hold so I could concentrate on the Cellarette. Those two are now complete so I could spend some concentrated time on this project. They were the Stone Carvers Bench and the Gilded Cat Box. Sarcastically, I’m beginning to think of the tray as a “twofer”; what do I mean by that? Well, I’m sure you’re familiar with the two for one sales and coupons. Here in Las Vegas they’re commonly referred to as “twofers”. Seems as if each phase on this project has required two steps to complete one step! The wood of choice was Walnut but when I first went to every one of our local lumber suppliers their Walnut was a few pieces of yellowish sap wood — not the rich Walnut tone I or my client wanted. The second trip, a few days later rewarded me with some nice, dark Walnut. After work began and I was ready to cut the recess for the Cuban Peso that will be embedded in it. As luck would have it, the Peso measures about 1-1/16″ in diameter. The needed forstner bits only come in increments of 1/8″ — where’s the “twofer”? Well, although the store closest to me said they had a 1-1/8″ forstner bit they didn’t so the “twofer” was going to a store further away to find it! Well, after all of that this picture shows that persistence has once again, paid off. For strength, the corners are finger jointed, a traditional method also referred to as a box joint. Using this type of joint exposes lots of face grain for gluing to give the needed strength. You can see the main feature of this under the strap. The front has been stylized and the Cuban Peso will be embedded in the center of the arched section. 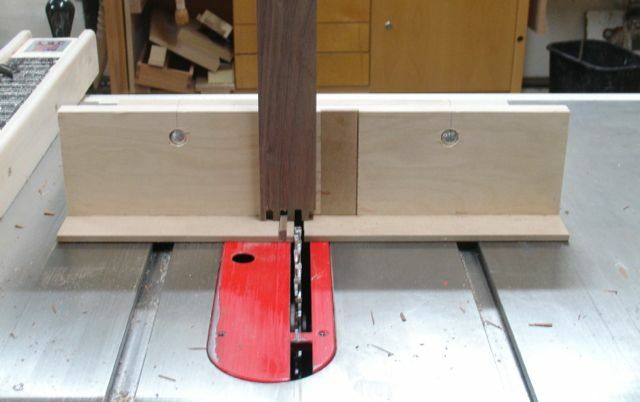 The finger joints were cut on the tablesaw using this jig. I decided to make another box for the Etsy store out of some recycled fence boards since everything was set up anyway. 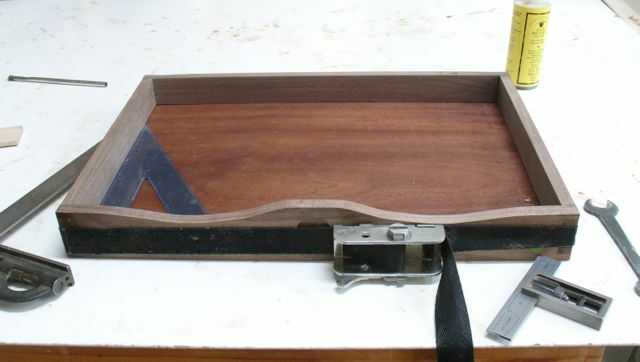 Although the use of this jig requires a bit of trial and error, once things are adjusted they are relatively easy to cut — just hard on the back as you bend over the tool! The bottom of the tray is a piece of the same plywood used for the Mechanical Cellarette’s back. 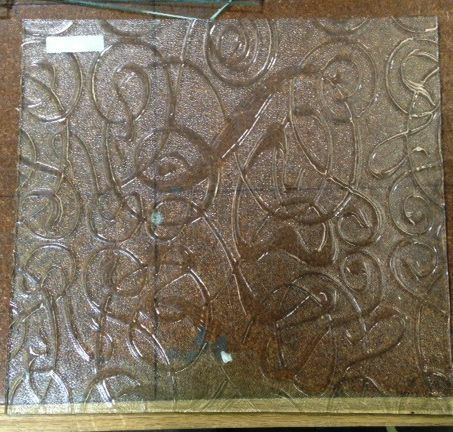 To elevate the over-all appearance of this tray I’ve decided to have a piece of glass cut for the bottom. I’ve used Glass Art Studio here in Las Vegas for projects such as glass front doors because they have some really unique pieces. In my opinion, the piece shown at the left has kind of an Art Deco flair to it that will work well in my clients office. Once his cigar box and the accruements are on the tray it should look great! Ideally, finger jointed boxes should have an odd number of fingers for best appearance. Since these are 1/4″ fingers the final height of the tray should be 1-3/4″ to yield 7 fingers. What complicated this though is that the arched section is 2″ at the center. So, the process began by cutting all of the pieces 2″ tall at first, then cut the finger joints, lay out and form the arch and cut the dado to support the bottom. After that I still needed to reduce the two sides and back to the 1-3/4″ height. This was done with the tablesaw and a plane. To transition the sides to the front piece I found that my small spokeshave was the best choice. This left sanding the insides prior to gluing the project together. I used Old Brown Glue, my favorite for these things because of it’s working properties. Let things dry for 24 hours or so then begin the finish process. This entry was posted in Current Commission, Uncategorized and tagged box joint, cigars, Cuban Peso, designer glass, finger joint, finger joint lay-out, Old Brown Glue, pattern routing, presentation tray, spokeshave, Tablesaw Finger joints, Walnut. Bookmark the permalink. 3 Responses to Cigar Presentation Tray — with a Cuban Influence! Good blog John. Nice piece of work.